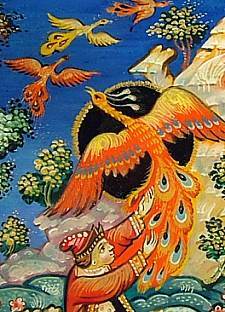 The favorite scene of Ivan and the firebird from "The Humpbacked Pony" comes to live in rich colors and dazzling gold. The bold palette compliments the graphic style and strong composition of the scene. 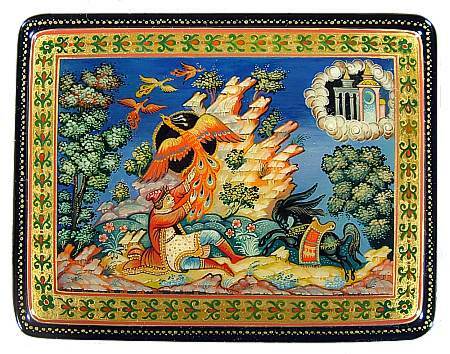 The Humpbacked Pony's warnings go unheeded as Ivan falls to the ground in his attempt to capture the legendary firebird. The bird gives a squawk of indignation as the impetuous lad refuses to let go of its tail feathers. A trio of his fellows wheel skyward, escaping towards an enchanted palace in the clouds, adding a sense of movement within the scene. 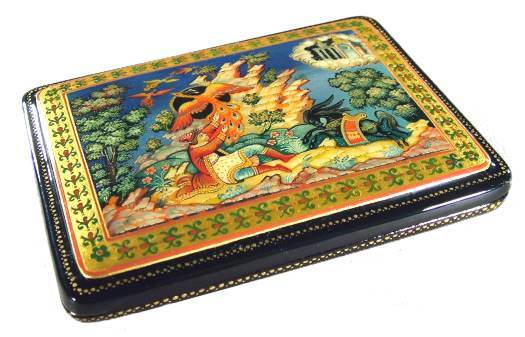 This box is made of high quality papier mache and is signed on its base with the title, artist's name (Inna Tikhomirova), and village. There is a hinge at the top, and the interior is deep red. The base of this piece is flush.